Removed from aircraft to be replaced with A220 due to European 8.33 requirements. Comes with mounting tray and will ship in A220 box. Rubber on selectors present but perished - easily replaced and quite normal for Icoms. EE English Electric Canberra. Radio Station Box VHF / UHF. RAF Aircraft. Part No: ERSP 34B. We can only export to certain countries. Lynx Avionics Radio Interface Unit. Condition is new. Old type radio interface unit (unpowered). Works with iCom A6 as well as earlier models. German version. Brand new and sealed. Skyshadow Frequency Radio Interference Filter. Rear Fuselage Belly Radio Aerial Antenna. Scottish Aviation Bulldog Aircraft. We can only export to certain countries. Used spares recovered condition as per photographs. Cessna Arc 300 Nav Com Aircraft Aviation Radio. Hello there and welcome to my listing. 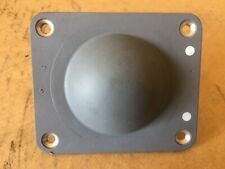 This listing is for a Cessna Arc300 radio, it was in good working order when last tested (not so long ago) but has since been sat in storage (so selling as untested). The radio also comes with the plug and backing plate with small wiring loom, please inspect the pictures. If you have any questions, please don’t hesitate to ask. Thank you for your time and for your interest. SEA-FIX MASTER UNIT TYPE 9431. Highly Desireable & Rare. 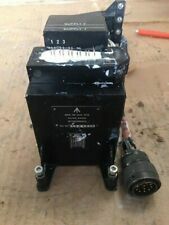 SEA-FIX TRANSMITTER UNIT TYPE 9430 Very Rare . Highly Desireable & Rare. Weight 12lbs. Collins Radio Co Distance Indicator 339D-1. The TY96 display is clear and bright, showing both primary and secondary frequencies along with ICAO or custom set airfield identifiers. A ‘Push Step’ knob allows the fastest change from 8.33 kHz to 25 kHz – so you can tune the radio quickly without compromising your look-out. Removed from RAF Leeming. Part number: 640/1/13323/104. We can only export to certain countries. RAF Aircraft. Part No: 630/-/37854/010. We can only export to certain countries. Serial No: 1171. R/10/84/PLA. Here is a box of 10 off 10 way sockets as shown. Its getting hard to find a lot of this stuff, so buy it while you can! Prices vary by weight. Vintage RAF Aircraft Compass MK4B Control Panel Type A Air Ministry Ref 6B/408. AIR MINISTRY NO 6B/408 SERIAL NUMBER L.
Removed from Aircraft XV307 1966 Lockheed C130K Hercules. Aircraft C130 Receiver V.H.F Radio. Burndept Becon Buoy BE369 Mk2 Emergency Radio Locating Beacon Vintage EPIRB VHF? I am not sure what frequency this transmits on but I suspect its 406MHz VHF distress frequency and would predate callsign transmitting. I have had it in my collection for about 12 years at least, it makes a good talking point. 12 – 11 – 4P4. Manufactured by Chelton. RAF Aircraft. Large Radio Aerial Antenna. We can only export to certain countries. Here is a pair of 2 way right angle radio plugs. Its getting hard to find a lot of this stuff, so buy it while you can! Prices vary by weight. For Ni-Mh and Ni-Cd batteries. We have this bakerlite Transmitter case. YA / 7690. in its original case. Prices vary by weight. Its getting hard to find a lot of this stuff, so buy it while you can! This item is a Serviceable Unit and fit for purpose. PART: 8-701-700-05. Here is a radio tray as used in many RAF types. Its getting hard to find a lot of this stuff, so buy it while you can! Prices vary by weight. Clansman Radio Selective Unit R.F. NSN: 5820-99-630-6142. Nimrod XV249 Receiver Radio. Removed from Aircraft XV249. Here is a radio tuning indicator, reading 0-16V. Its getting hard to find a lot of this stuff, so buy it while you can! Prices vary by weight. There's progress for you. Marconi comms system. Type 7429, Serial No. 688728. Radio Frequency Radiation Emitter Unit. This item is straight from the MOD. Used - Not Tested. RAF Hawker Siddeley Andover Aircraft. Fitted to a large variety of aircraft including – Andover – Jet Provost – Harrier etc. Radio VHF Transmitter Receiver. Type AA1201-2. We can only export to certain countries. Here is a mounting bracket for radio related parts in the Canberra. Its getting hard to find a lot of this stuff, so buy it while you can! Prices vary by weight. Here is a UHF radio junction box assembly. Prices vary by weight. Its getting hard to find a lot of this stuff, so buy it while you can! WWII Era Radio Receiver Type R1584. US Navy WWII Aircraft. this frequency. An aircraft carrier had a rotating aerial, which sent out a different. the aircraft knew which direction to turn to locate the carrier. EX MOD Aircraft Radio ? Ex RAF Aircraft Radio Dial ?